You can always plug us into your GPS system, the Latitude 29.722831° and Longitude -95.337207°, or our address is 4701 Calhoun Street, Suite 150, Houston, TX 77004. 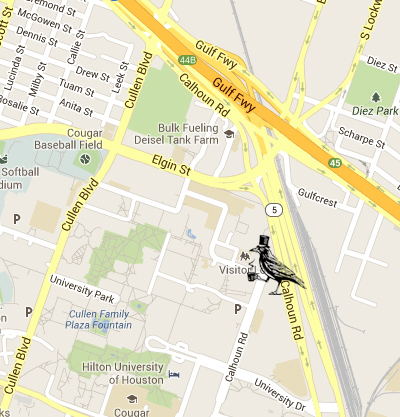 We’re in Cougar Den Plaza, down where Calhoun dead-ends by the Calhoun Lofts Apartments. It’s a short walk from virtually anywhere on campus, and it’s right across the street from the Campus Loop bus stop in front of the Calhoun Lofts. If you’re coming from off campus to visit us, you’re always welcome. The quickest way is to make your way down spur 5, turn onto University Drive, and go North on Calhoun, we’ll be on the right once you get to the stop sign. Monday through Friday, 7AM – 12PM. After 8pm on weekdays, and all day Saturday and Sunday, you should feel free to park in the campus parking lots without a parking tag.